Every city is a particular place, but it has cinematic connections to all the other great cities of the world, their projections traversing time and space. As The Naked City, a 1948 noir, opens with a panning shot over the city where I live, it seems to me that cinema invents views as well as plots—contrary to what is believed to be a camera’s power to strip the object in its eye, making the hidden visible—that is why cameras have been banished from some places. Exteriority of locations in film lends sociability to the production of private spectacle. 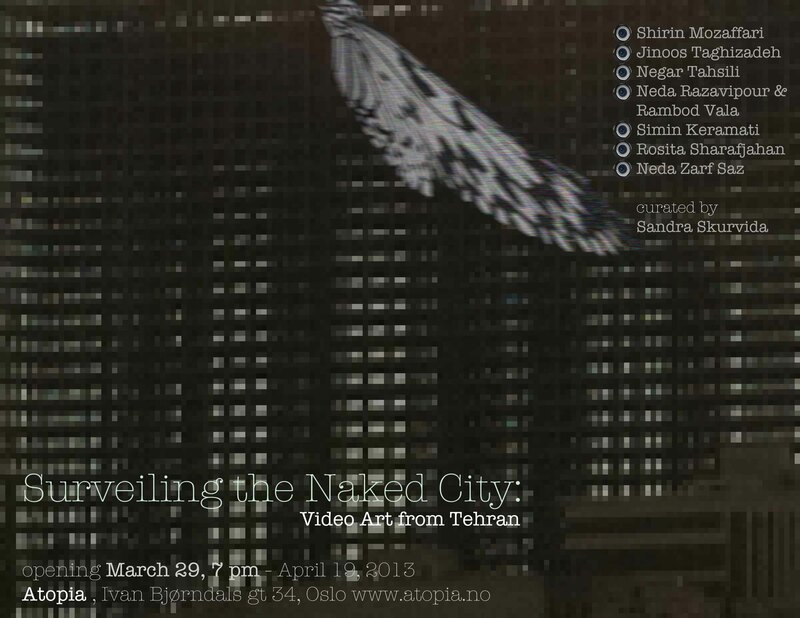 In Iran, where public representations are tightly legislated, film and video have been developing in the diverging directions—film production is fully controlled by the state apparatus; whereas video art may not be subject to such codified restrictions, both in its production and in exhibition, which takes place in visual art institutions rather than movie houses. Film plots tend to situate private dramas in public spaces (especially where female characters are involved) in order to reconcile fictional reality of privacy and its public representation in film in compliance with the codes of representation. Video makers address public and social issues in private settings and further interiorize them through personal and intimate approaches. The rtists who work in the public space despite prohibitions play important societal role, inserting their personal point of view into the public sphere, thus potentially modifying the codes of public life as well as its representation. A woman with a video camera—all the artists in this program happen to be female, asserting the feminine position in the public sphere—can turn its surveiling insight at the powers that be. The artists take to the streets of Tehran, and show us their city as they live it. This selection of video art, documentary film, and performance documentation conveys their points of view.